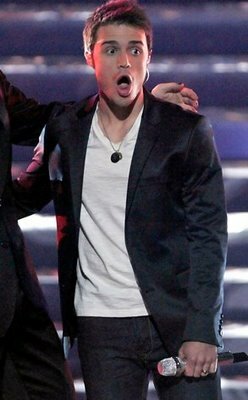 I still can’t believe Kris Allen actually won American Idol! He has been my favorite since about mid March and the show began in January. I have to write about this because I’m so fascinated by this. Not only was he the underdog that came out of nowhere about 5 weeks ago but he’s a Christian too! When the show started, they showed him only a few times. He wasn’t really tal ked about much so by the time he made it to the top 13, we didn’t really know much about him at all. I remember his audition and it was nothing spectacular, but he definitely was good. For weeks and weeks people were talking about Danny Gokey (another Christian worship leader I might add) and Adam Lambert. Then about 5 weeks ago, Kris had one great performance and from then on he did great every week. American Idol is one of the few shows that we watch each year. This year was pretty awesome with 6 out of the top 13 contestants being Christians! 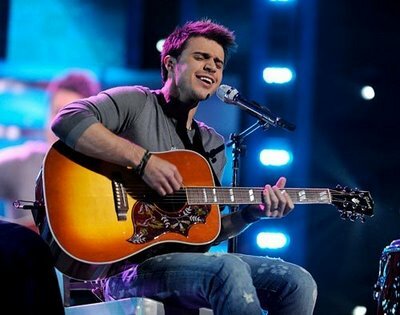 Kris Allen helped lead worship at his church before auditioning for AI. The media has labeled him the “humble one” because he never spoke too highly of himself and he was always genuinely shocked every week that he made it through to the next round. When Ryan announced his name as the winner of AI, he was so completely shocked (as you can see in the picture to the right). It just seems so unheard of that someone with his personality and someone so humble could win something like AI. I think it’s fantastic! I don’t know anything about his walk with Christ, but I think he definitely is going to (and has already been!) a light in the dark world of Hollywood. I’ve never felt so happy for a winner of American Idol before. I’m not sure if he’ll enter the “Christian Music” scene or not. Either way, I’m excited for his album! It is one album I will definitely be buying. ← Sickness Rant and Zoe in Shorts!